These are six of the thirteen children of Joseph Hale and Eliza Hadley, who were married at St Paul’s Church on 13 August 1844 at St Paul’s Church and who lived over their baker’s shop at 6 Cardigan Street. See their separate grave for the full history of the family. 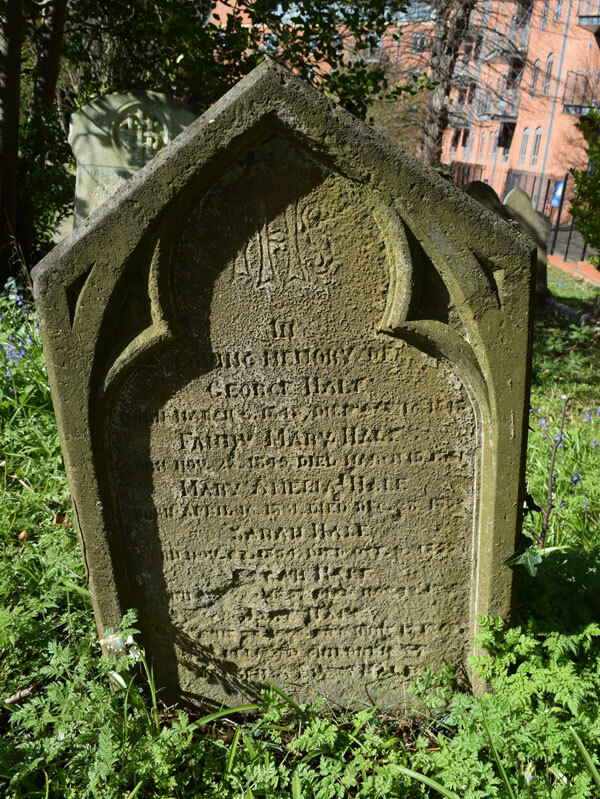 † George Hale died at Cardigan Street at the age of seven months on 22 October 1848 and was buried at St Sepulchre’s Cemetery on 26 October (burial recorded in the parish register of St Paul’s Church). † Fanny Mary Hale I died at Cardigan Street at the age of thirteen months on 18 March 1851 and was buried at St Sepulchre’s Cemetery on 20 March (burial recorded in the parish register of St Paul’s Church). She was buried in the same grave at a depth of 5 feet. † Amelia Mary Hale I died at Cardigan Street at the age of eighteen months on 28 December 1852 and was buried at St Sepulchre’s Cemetery on 31 December (burial recorded in the parish register of St Paul’s Church). She was buried in the same grave at a depth of 5ft, so must have been laid beside her sister Fanny. † Sarah Hale I died at Cardigan Street at the age of eleven months in October 1855 and was buried at St Sepulchre’s Cemetery on 10 October (burial recorded in the parish register of St Paul’s Church). The sexton recorded this burial in the same grave, but gave no depth; and he did not record the final two infant burials. † Sarah Hale II died at Cardigan Street at the age of three months in November 1857 and was buried at St Sepulchre’s Cemetery on 5 November (burial recorded in the parish register of St Paul’s Church). † Jane Hale II died at Cardigan Street at the age of two in June 1865 and was buried at St Sepulchre’s Cemetery in June (burial recorded in the parish register of St Paul’s Church).